Managing opiates leads to a host of issues with patients, for pre-empting pain while ensuring communication of clear limits and preventing abuse. These goals confound many internists, but clear-cut and easy guidelines presented at Internal Medicine 2012 can help internists achieve the best outcomes. Delivering unpleasant news is one of the hardest tasks a physician faces. Assessing sensitive topics heightens the difficulty, and two physicians at Internal Medicine 2012 address ways to handle especially sensitive areas: sexual history, and the inability to safely drive a car. Drugs that made this doctor's least-most-wanted list, presented at Internal Medicine 2012, included those that increase costs without improving care, or that raise the risk of antibiotic resistance. Genetic tests have made tremendous advances, and primary care physicians are going to be the ones who determine whether they're used, and how frequently. Here are a few pointers from Internal Medicine 2012 on what criteria to use. Physicians seeking to counsel patients on weight management need to start early, be proactive and discuss activity and nutrition at every visit, said one presenter at Internal Medicine 2012. The end of residency rotation isn't the only opportunity to teach. Assessing physicians should occur continuously, with a clear plan for a conversation between the attending and the trainee. The United States won't control health care costs until it addresses the excessive prices it pays for some health care services. Wrap-up coverage of ACP's annual meeting covers how to make opiates safer and more efficient, how to address the sensitive topics of sexual history and an inability to drive, and what are the worst drugs to come to market, among other topics. Medicare is focusing heavily on preventing fraud, but with an eye toward not burdening legitimate clinicians. Learn three things a practice can do to reduce its chances of being audited. Financially stressed private practices are seeking shelter through acquisition by a hospital chain. But owners need to scrutinize their costs and expenses before entering into negotiations. 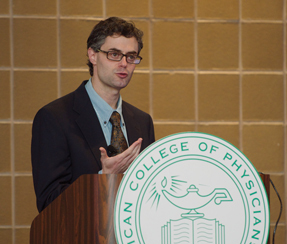 ACP presented John Tooker Evergreen Awards to six chapters at Internal Medicine 2012. The program provides recognition and visibility to chapters that have successfully implemented programs to increase membership, improve communication, increase member involvement, enhance diversity, foster careers in internal medicine and improve management of the chapter. ACP maintains an updated list of chapter meetings online. Members can call Customer Service at 800-523-1546, extension 2600 (M-F, 9 a.m. to 5 p.m. ET) to receive any other meeting information. A 29-year-old woman is evaluated for a petechial rash of the lower extremities of 3 weeks' duration. The patient reports no bleeding problems except for recent, occasional bleeding from her gums after brushing. Physician examination reveals petechiae limited mainly to both lower extremities, with a few spots noted on her forearms and abdomen. What is the most appropriate next step in management?.